Let Good Stuff Catering cater your event in Kelowna or surrounding areas! 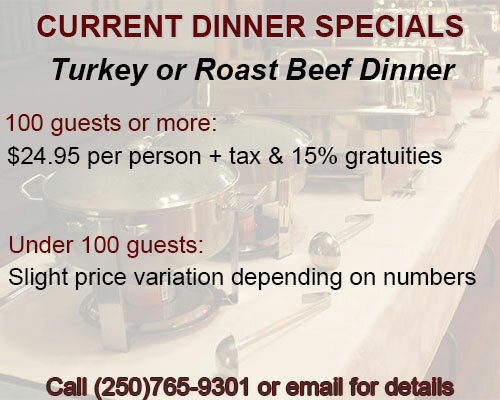 Our Kelowna based catering service serves good, wholesome home-cooked meals at extremely reasonable rates! Good Stuff Catering is a family-owned and operated business proudly serving the beautiful Okanagan Valley region of British Columbia, Canada. Based in Kelowna, BC, we have the experience and versatility to complement any style of event. Your event is all about keeping you and your guests happy, and we can help do that. Happiness means seeing that everyone has a good time, eats some great food, and goes away smiling. We hope that with our help, you'll have a chance to relax and enjoy your special occasion, knowing the food and service is in extremely capable hands. With a full range of great, healthy home-cooked foods, along with superb customer services for events big and small, Good Stuff Catering's Ken and Rita Schermann can help you plan and realize your ideal wedding reception, special occasion events such as birthdays, family barbeque, anniversary, luncheon, business meeting or outdoor event. We can prepare and deliver cold foods or hot, and we have a full Mobile Food Truck for larger events, so we can even bring the kitchen sink! Please note that all pricing includes servers and dish clean up!!! Just call (250) 765-9301 or email for more information. We look forward to hearing from you. Good Stuff Catering believes that great food doesn't have to be expensive. We offer low cost, great tasting, wholesome food! Family gatherings, Christmas parties, special occasions... let us do all the work for you, no matter the occasion. We will handle every step for you! Have a wonderful reception without paying an arm and a leg! Keep your per person cost within your budget and still enjoy a variety of choices! Outdoor party or don't have kitchen facilities? Fully catered events - breakfast, lunch, light dinner or full dinner - contact us!